SUMMARY: The team at Abila, a software solutions B2B, was suffering a site challenge. They weren't seeing the engagement they wanted, which was made especially difficult by Abila's broad range of customer segments. Abila targeted its highest traffic page — the homepage — to test a segmentation campaign. Learn how this homepage banner customer segmentation effort increased time on the site 171% for customers while decreasing bounce rates 85%. 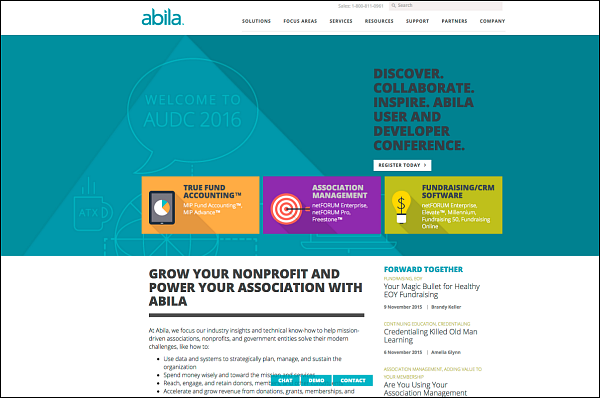 Abila offers software and solutions for nonprofits, associations and government agencies. Primarily, the software is designed to be used for fund accounting and relationship management, but the company does offer other software solutions, such as a learning management system. 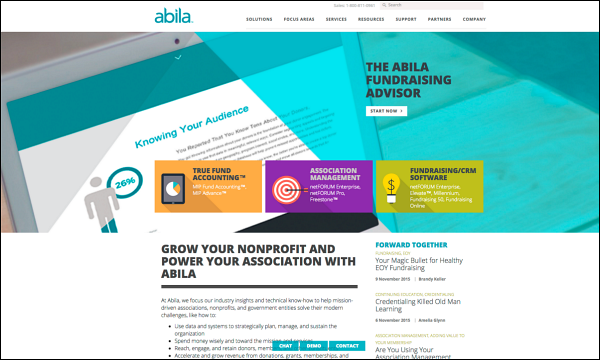 According to Nathan Stull, Digital Marketing Manager, Abila, the company covers several different customer segments, but its typical customers are nonprofit organizations. The company has products designed to help both small and large nonprofits, he said. "And then, to switch gears, we also have association customers for our association management software. And that's a whole different entity in and of itself from the nonprofits, and their needs are completely different from the financial software we have for the nonprofits," Stull said. Because Abila has such a large range of customers, catering to each customer segment's needs is a major challenge for the organization. It's important and often difficult to get the right message to these three completely different audiences, Stull said. Additionally, the team was seeing a significant rise in bounce rates from Abila's homepage. They wanted to increase site engagement while better catering to these different customer segments. "We had started to see a slump on the site, and it was sort of going stale, so we wanted to do some things to sort of get them re-involved with our content," he said. The team at Abila met with its vendor to determine exactly what needed to change on the site. From this first meeting, they decided to focus on the site's impact and implemented a primary goal to increase and measure engagement. As a group, they decided the best idea would be to test on the page with the most traffic. That is how the homepage was selected for this segmentation campaign. "Once we identified the page, then we sat down and really looked at it, and examined it, and determined where on the page we wanted to launch the campaign, which became the homepage banner," Stull said. "And so we basically, at that point, decided, 'OK, we're going to segment this homepage banner, and use that as our delivery mechanism for the content to these different segments, as it were.'" After deciding to focus on Abila's homepage banner, the team then went to work deciding what segments they wanted to first concentrate on. Customers were defined as people or companies who had already purchased from Abila, and a big goal for this segment was not pushing the product onto them since they had already purchased. Customers and prospects were the two big divisions the Abila team made. "We wanted to make sure that we gave our customers different content than we gave our prospects," Stull said. Initially, prospects were merely separated from customers and partners. However, as the campaign has matured, several sub-segments have been added to this broad customer segment, allowing the Abila team to better personalize the homepage banner's messaging for specific prospects. "It's a mixed bag of many things, and I'm constantly, it seems, adding more segments, which is fun," he said. Finally, there was a third category for partners. This category was created with the same logic that was used to separate prospects and customers: Abila did not need to sell to its partners in the same way it would need to sell to prospects. However, this segment also did not need the same content or messaging as Abila's customers, Stull said. After it was determined which customer segments the differentiated homepage banners would focus on, the team then had to determine which content would be most relevant to each segment. For this aspect of the campaign, Abila used a vendor that specialized in sorting content for segmentation efforts. For customers who are now using Abila software, Stull said the goal was to give them resources to be successful. "So the goal behind the customer content was to basically point them to areas that they're most likely going to be looking. So these things would include our knowledge base, our support team," he said. 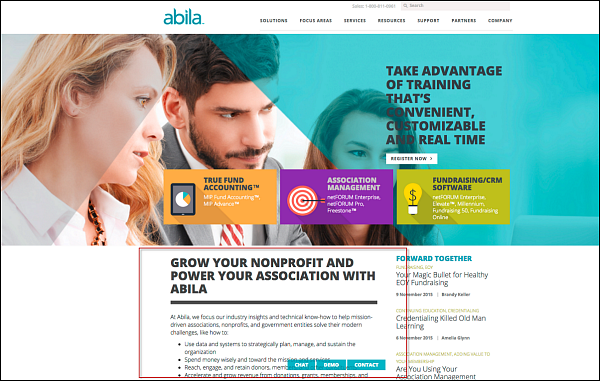 The homepage banner's messaging would also point customers to Abila's training resources. According to Stull, these training sessions are fairly customizable and available for every product. For Abila's partners, the banner's messaging focused around the company's marketplace and "sort of the partner ecosystem that we developed for them," Stull said. However, the most diverse banner messaging could be found for the prospect segment. This is where all of Abila's campaigns go, he said. Abila has four campaign managers on board; one for customers and one for the three audience segments that were previously mentioned — nonprofits, associations and government agencies. "So every time they launch a new campaign, I'm able to take that new homepage banner and apply it to the proper audience segments, instead of just slapping it up on the homepage and hoping for the best," Stull said. While most of the content linked to the homepage banner was content that Abila had already created, the team did implement some specialized content creation efforts as a result of this segmentation campaign. According to Stull, moving forward in content creation, the team thought more about how each piece would fit into a customer segment as well as how it would relate to the homepage banner. "We very much needed to create new content for the customer segment, because we didn't have that before. This was actually an entirely new opportunity to reach our customers more directly," he said. Abila utilized a vendor to incorporate its segmentation efforts into the site's backend. This involved the two teams working closely together to ensure that segments were created to Abila's specifications before being added to the backend. Specifically, a specialized code snippet was added to the homepage's banner, which allowed Abila to use the predetermined content on any page of the site. This could be further specified on the backend. For example, if a piece of content could only run on certain pages or for a certain length of time that could be customized on the backend. This was especially useful when it came to running campaigns. According to Stull, this element was helpful if Abila was running a campaign that required a specific CTA. It was relatively easy to change this CTA on the backend, creating a more personalized experience for the customer. In this way, it helped the site function as a better lead generation engine. "Of course having the very specific call-to-action was all part of that content creation because we wanted it to be very focused and also just very driven, to drive them to behavior that we wanted them to take," he said. Abila saw results on its homepage banner segmentation effort right away. The campaign was launched in February, and by March and April, Stull said, the team started to see an uptick. According to Stull, these results didn't just apply to the homepage but to several sections of the site. These results correlated with Abila's goals to increase engagement because engaged visitors typically visit more pages and stay on the site longer. "So we saw those two big numbers increase. Then we also saw that when someone saw targeted content, their bounce rate dropped 85%," he said. From this campaign, the Abila team has learned that their segmentation efforts are working, and they're looking to implement more segmented campaigns. After tackling the most trafficked page on their site, Stull says, the team is now looking to optimize other pages on their list. The company has also started further segmenting its customer segments to better focus on specific audiences. "So instead of just having those two big segments, now we're up to quite a few, at least six or seven, related to that campaign," he said.